From an upright, standing position (feet shoulder-width apart), place the bat next to the right foot (bat head down, knob up; perpendicular to the floor). Have your daughter grasp the handle of the bat with their "top hand" (right hand) as low as possible without leaning over to do so. With the same hand, have her swing the bat up onto her shoulder and place her "bottom hand" (left hand) directly under it, as if ready to hit a ball. Note the distance between the bottom hand and the top of the knob. If the bottom hand covers any part of the knob, the bat is too short. If the distance of the bottom hand and the top of the knob exceed two finger widths (without moving her bottom hand, have her take her top hand off and place her index and middle finger beneath her bottom hand), the bat is too long. The weight of a bat is going to fall on the comfortability of the batter. She will need to be able to swing a bat strongly for power, but quickly because we play fastpitch softball afterall (8U pitching machines will be calibrated for 35mph; 10U pitchers can pitch 30-50mph). A bat that is too light can be swung quickly, but at the expense of power; a bat that is too heavy will get swung too slowly and may result more foul balls or strikeouts. Grasp the handle of the bat with the top hand only (same manner as Step 2 above) and hold it straight out in front of you (knob down, bat head up; arm parallel with the floor, bat perpendicular). Difficulty in holding it parallel for 3 seconds, or discomfort in turning the bat head down/back up, means the bat is too heavy. Coaches will be more likely to approve the use of bats that are too light over bats that are too heavy. This is a preference issue. Bats are made from either an aluminum alloy or carbon composite materials. Aluminum bats are less expensive and work well immediately, and degrade in performance over time (couple of years). Composite bats are more expensive, but perform better the more they get used. 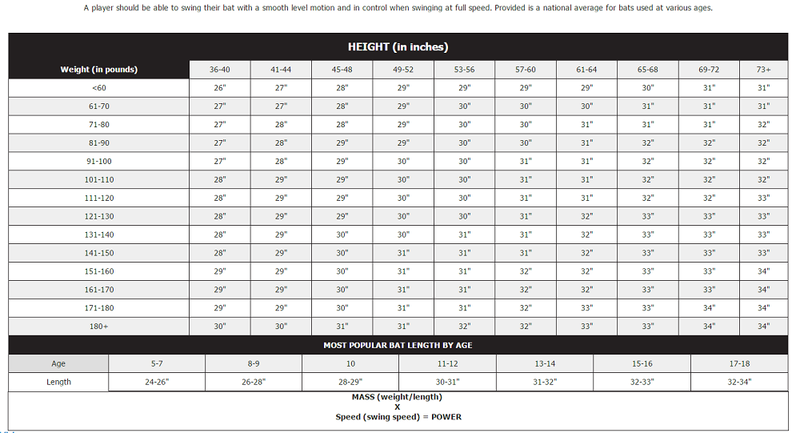 Because the length of an arm can vary between each girl of the same height, please use this chart as a 'guide', and refer to the information above for a more proper fitting.